Sell Stocks and Buy Commodities and Precious Metals? Time to Sell Stocks and Buy Commodities and Precious Metals? 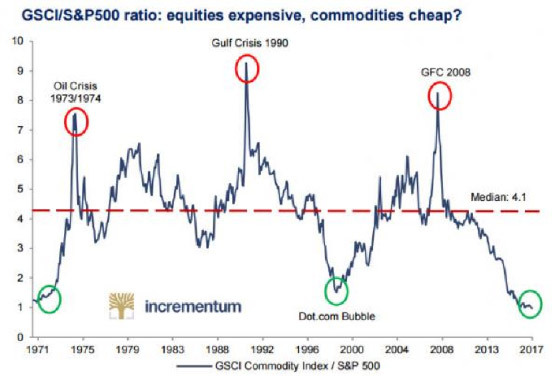 Richard Nixon was president the last time commodities were this cheap relative to stocks. This sort of extreme relative low in the Goldman Sachs Commodities Index, which includes precious metals, has been a reliable indicator of bottoms in the past. After years of lagging stocks, the time may be coming for hard assets to shine. However, given the increasing certainty that the Federal Reserve and other central banks are actively managing asset prices in a variety of markets, it is even tougher than usual to guess about timing. It is easy to make a fundamental case for a correction in share prices. Predicting exactly when the central planners managing our markets will lose control is a lot harder.